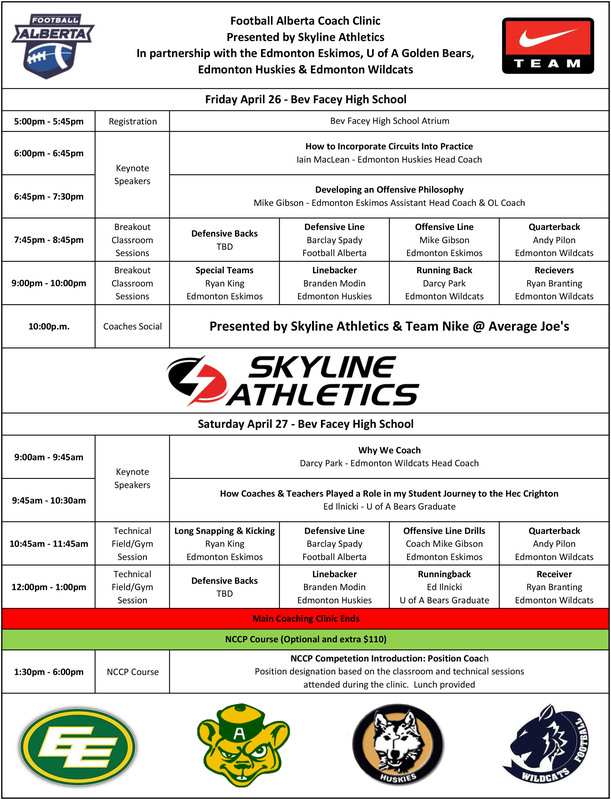 Football Alberta is hosting a Coaches Clinic April 26 & 27 in Sherwood Park in partnership with the Edmonton Eskimos, U of A Golden Bears, Edmonton Huskies and Edmonton Wildcats. The clinic is being hosted at Bev Facey High School and sponsored by Skyline Athletics & Team Nike. The focus will be on High School Coaches but open to Coaches at all levels. We will have 4 Keynote Presenters along with classroom and technical field/gym sessions for all 7 positions plus Special Teams. Presenters include: Eskimos Assistant Head Coach Mike Gibson, Eskimos Ryan King, Hec Crighton Winner Ed Ilnicki, Wildcats Head Coach Darcy Park, Huskies Head Coach Iain MacLean and much more. In addition to the Clinic, Football Alberta will be offering an NCCP Competition Introduction Position Coach Course on Saturday afternoon. All positions will be offered based on the clinic technical sessions Saturday morning.